Bottom Line: Living with integrity is possible when you walk with God. A long piece of yarn that will make a large ball when wound. Integrity quotes written on individual cards for volunteers to read. Give each student a balloon which they blow up and tie. The challenge of this game is for everyone to keep their balloon in the air by hitting it. Your balloon touches the ground: sit down. Anyone else’s balloon touches you: sit down. You look ANYONE in the eyes: both sit down. If you say anything: sit down. Leader: Watch carefully for students who might be ‘stretching’ the rules such as looking at someone and not sitting down, accidentally getting touched by another balloon, or talking. Hopefully, these rules will prove more challenging for students, and they might begin to try to tell others who break the rules to sit down, which is one of the things that means they have to sit down. Once the first round is over, which means that only one person is standing, ask the group if they have any questions about this game. Ask them which rule was the toughest to remember. Say: Ok, let’s try this again, and remember the rules. Gather the group together and be sure to take all of the balloons! What was the toughest part about this game? Here is a strange question, but an important one: How tempting was it to cheat at this game? What are some of the ways that you could have cheated at this game? Come, on, someone HAD to have cheated at this game, right? How simple was it to ‘act’ like someone’s balloon didn’t really touch your arm, or maybe you did look at someone, but you both kinda had this secret ‘look’ and acted like neither of you looked at the other. Leader: Share a personal story about a time in your life in which it was very easy or tempting to cheat. Think about integrity like this piece of string. As we read, in these quotes, integrity seems to begin small. “Integrity is who you are when no one is looking”, one person said. But think back to a time when you told a ‘small lie’. Then you had to cover with another lie. It became more and more difficult to remember who you told what. And with each lie, things became more and more complicated. Think of how many times you see on TV that some famous person, everyone thought was an example and honest, actually messed up big time. No, it begins in those small decisions – telling one small lie or changing that one detail. Thinking to yourself “No one saw me, so it’s not that big of a deal’. One day you will wake up and what started out so small, has become a big giant ball of lies. Some of you may have heard about King David in the Bible. He was an awesome king and was called a ‘man after God’s own heart’. Yet, this amazing king made one small choice, which led to one lie, which led to another and another. Up to the point that David, the King, had stolen another man’s wife, committed adultery, had her husband killed in battle, and still seemed to not admit that he had done anything wrong until he was confronted. David messed up big time. It took David coming face to face with the huge mess that he made to realize that he had betrayed God. He had sacrificed his integrity. It’s easy to look at others and wonder how they could put themselves in that type of situation, but let’s be honest: All of us have fallen and been less than honest – if we are honest! Maybe you talked about a friend behind their back, or told your parents that you finished homework that wasn’t finished. Or watched that video you know you shouldn’t have or said something you regret. You reason with yourself that it was a small thing. Or that nobody knew about it. But there is something that we all tend to forget: Someone DOES know. What if I were to tell you that I have a video of your darkest secret? A video that would show every single lie that you’ve ever told? Some of you might be thinking: it’s not possible, but just imagine for a moment that it could be possible. What would you worry would show up on this video? What would you never want anyone to know or to see? Because this imaginary test will help you to answer this tough question: Do you live with integrity? Ask anyone who has made bad choices and they will tell you that it started small. They never realized that it was THAT moment, behind that closed door, or on that one text message that they compromised who they were. In those moments, you realize that who you are and who God wants you to be are very far apart. The good news is that God can help you, but first, you must let him help you to be honest with him and honest with yourself. David wrote this amazing prayer to God. Yes, the same David who stole a man’s wife and had him killed. The man who realized his sin and came to God pleading for forgiveness. I am going to read this prayer once more and I want you to spend some time quietly letting God search your heart. Ask God to point out those things in you that are ‘knotted’ up. The ways that your integrity is less than God wants. Remember, for each of us, this should be a daily thing. I challenge you to pray this prayer each night before you go to bed, and see how God helps you to live the life of integrity that He is calling each of us to live. Living a life of integrity is possible, but only with God showing us our true selves every step of the way. God is patient and loves us and WANTS us to live lives of integrity. God will forgive you for the ways that you have failed to be who he created you to be. Pray: Lord, walk with us. We need your guidance every single step of the way. Help us to see those times when we have a decision to make about who we are and who we are not. Help us to follow you and not our own desires. And show us the way that we need to walk, talk and think to stay in step with you. What are some of the greatest tests of integrity that youth face today? Which integrity quote did you identify with the most? If time allows, read each of the integrity quotes again and discuss them. 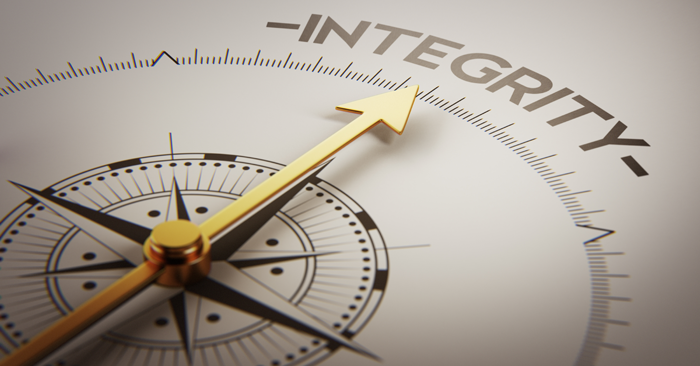 Do you think integrity is valued today in society? Why or why not? What do you think is the biggest challenge that youth face in keeping their integrity today? Share a time when it was very tempting to lie or be less than God would want you to be. What types of situations test your integrity the most?